Team USA’s final competitor in the WSB/APB Olympic Qualifying Event, light heavyweight Jonathan Esquivel (Anaheim, Calif.), took on a difficult challenge on Tuesday in Vargas, Venezuela. After winning his opening bout of the tournament, Esquivel drew former world champion and 2004 Olympian Hassan N’Dam N’Jikam of Cameroon in the professional boxer’s tournament debut — a tough break in a controversial situation. Despite N’Jikam’s extensive professional and amateur resumes, Esquivel was not intimidated by his experienced opponent. He came out looking to land heavy shots and take the bout to the 2004 Olympian. Esquivel got stronger as the bout wore on, winning the third round on two of the judges’ scorecards. Yet N’Jikam was awarded the victory by unanimous decision, taking the match by only one round on each of the judges’ cards. The loss eliminates Esquivel from 2016 Olympic Games contention. The 21-year-old won the light heavyweight title in the 2016 Olympic Trials for Men’s Boxing in December to earn the chance to compete in the Olympic qualifying events. Women’s Head Coach Billy Walsh (Colorado Springs, Colo.), Associate Men’s Coach Kay Koroma (Alexandria, Va.) and Assistant Coach Augie Sanchez (Las Vegas, Nev.) will serve as the Olympic coaching staff in Rio de Janeiro. The qualified athletes are currently participating in a multi-nation training camp at the Olympic Training Center in Colorado Springs, Colo., and will depart for Rio de Janeiro on July 19 to finalize their Olympic preparations. 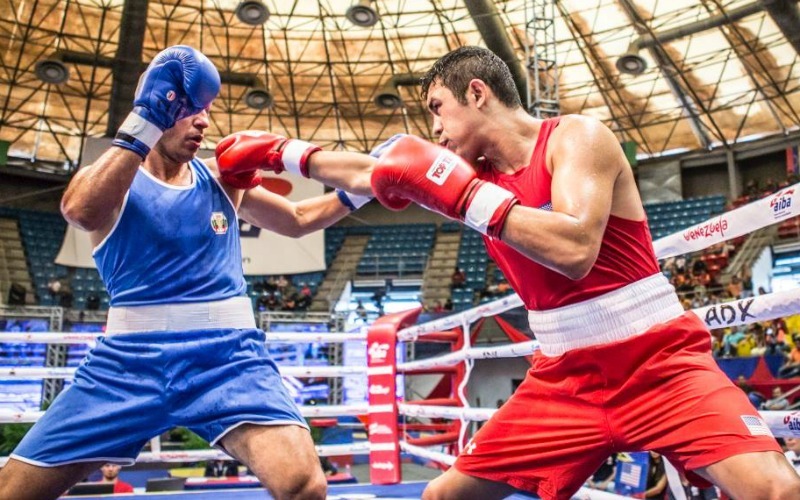 Tuesday in the Venezuelan city of Vargas saw a further eighteen contests of world-class boxing at the APB/WSB Olympic Qualification Event. The light flyweight (49kg), bantamweight (56kg), middleweight (75kg), light heavyweight (81kg) and super heavyweight (+91kg) boxers were in action on Day Three, all with Olympic dreams driving them on. Of the 40 boxers now remaining in the competition, 26 will qualify for Rio 2016. In the opening bout of the day, Argentina’s APB light flyweight Leandro Blanc overcame Trinidad & Tobago’s London 2012 Olympian Carlos Suarez with a controlled performance and will now face Ecuador’s Carlos Quipo in the last four. Quipo’s teammate Marlo Delgado progressed to the middleweight (75kg) semis with a comprehensive win over Dominican Republic’s Raul Sanchez, where he will meet Turkish veteran Onder Sipal for a place in the final. “I did my very best in the bout since this is my last chance to qualify for the Rio 2016 Olympic Games. Our tactics were based around the accuracy of my punches and good footwork to confuse my opponent, and now I expect to win my forthcoming semi-final and take the ticket for Rio on Thursday,” said Ecuador’s 23-year-old Marlo Delgado. Venezuela’s Endry Saavedra defeated Bulgarian Arman Hakobyan with some quick combinations and solid defences to set up a showdown with Xhek Paskali in the second middleweight semi-final, after the German had overcome tough fellow APB boxer Bogdan Juratoni. Another talented Venezuelan, Edgar Ramon Munoz, dominated his super heavyweight (+91kg) quarter-final with Egypt’s Ahmed Samir Abdelmoaz Hefny and will meet the Venezuela Caciques’ WSB Draft Pick Cosme Dos Santos Nascimento in the next round following the Brazilian’s win over Hungarian APB boxer Istvan Bernath. Ukrainian super heavyweight (+91kg) Rostyslav Arkhypenko’s fast hooks and big uppercuts then surprised Russia’s former EUBC European Champion Magomed Omarov, earning him a unanimous decision and a place in the last four. South Korea’s AIBA World Championship silver medallist and London 2012 Olympian Jonghun Shin again showed why he is considered one of the best light flyweights (49kg) in the world with a commanding win over Ukraine Otamans’ WSB talent Nazar Kurotchyn, setting up a mouthwatering semi-final against Mexico’s victorious Joselito Velasquez. Kenyan bantamweight (56kg) Benson Gicharu Njangiru continued to build on his strong APB performances with a win over Italy’s Riccardo D’Andrea, and will look to use his growing confidence to negotiate a tricky semi-final against Venezuela’s Victor Rodriguez on Thursday for the all-important Rio 2016 Quota Place. The result of the day came from Cameroon’s Hassan N’Dam, quarter-finalist in the Athens 2004 Olympic Games, who delivered a super performance ending last Olympic chance of American boxer Jonathan Esquivel in the light heavyweight category (81kg). He will now face a strong opposition from Ukrainian Solonenko Denys who convincingly won his contest against Mexico’s Rogelio Romero. Carrillo Palacio Juan Carlos from Colombia and Polish Tryc Mateusz Jerzy have kept their dreams to go to Rio alive after they both progressed to the semi.